Many salmon flies and larger trout lures call for a wing of squirrel hair. Most animals have hair that is hollow and a dense underfur to provide insulation. The tail of a squirrel however is pretty much all bone and therefore insultation is not needed. The Squirrel tail hairs are hard and shiny. They shed dirt and dust and do not clog up with water. This is important to the squirrel who uses his tail as a balance and also as an extra hand. It is also important for the fly tyer as it gives us a material that keeps it shape when wet and provides a constant profile for the fly. The downside of this is that the tail hairs are possibly the most difficult hairs to tie in with confidence. There are a few little tips that will help you with this lovely material. 1) Always use a strong thread. Constant applied pressure is needed to secure the wing bunches and thin midge threads are not strong enough. I use 8/0 or even 6/0 on salmon flies where a bulkier head is less important. 2) Always wax your silk for attaching the wing bunch. 3) If you want your wing to sit on top of the hook put a turn of thread around the bunch before offering it up to the hook If you want the wing to spread around the shank and sit lower then miss out this step but be careful that the wing fibres do not migrate to the bottom of the hook. 4) When cutting away any excess, always hold the wing while making the cut. Try and make a single cut. Your very best and sharpest scissors will be a big help. 5) Once the waste ends are cut away add a drop of varnish to the cut ends. 6 ) Complete the head carefully ensuring the thread doesn’t slip off the front of the wing bunch cut ends. The waxing of the thread helps stop this. You can work turns of thread into the cut ends as you build the head. This gives added security and makes it less likely that the wing will pull out. The Church Fry is so out of fashion that I couldn’t find a photograph on Google! 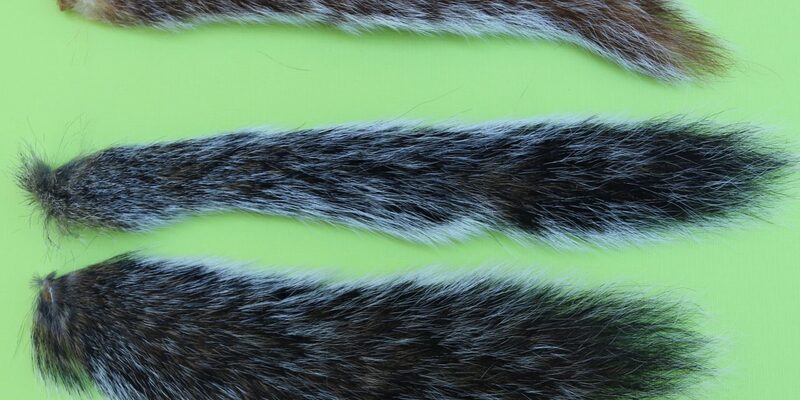 Wing:- Natural grey squirrel tail. Originally designed as a pattern to represent small fry at Grafham water. This fly has also proved to be a small water killer. As with the Sweeney Todd below it is now out of fashion and cannot be purchased commercially which is a shame as both flies are still very effective. Wing:- Dyed black squirrel tail.